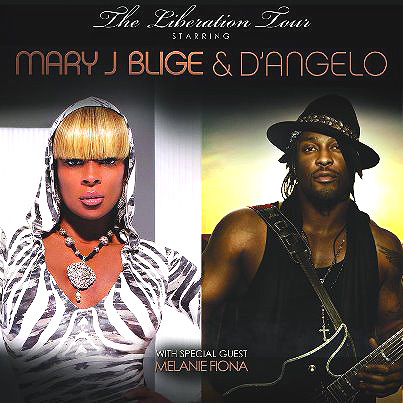 Blige will be touring in support of her latest release, 2011′s My Life II… The Journey Continues (Act 1). The singer’s tenth studio album is titled as the sequel to her 1994 album My Life. It debuted at #5 on the Billboard 200 after its release last November and has been powered by singles “25/8″, “Mr. Wrong” and “Why”. My Life II… The Journey Continues (Act 1) features an array of special guests including Beyonce, Drake, Rick Ross, Busta Rhymes and Nas. D’Angelo is reportedly working on his comeback album, though no release date has been announced for the singer’s third studio album and follow-up to 2000′s Voodoo. He recently made headlines by delivering his first stateside performance in over a decade as part of an unannounced appearance during the “Superjam” lead by The Roots’ Questlove at the Bonnaroo Music Festival.